River running at it’s best; continuous white water, impressive granite gorges in the foothills of the world’s highest mountains. The British obsession with the sub continent is something that is difficult to explain, no matter where you are from; perhaps it is best experienced for yourself. The Himalayas have so much white water to offer it’s a job to know where to start. Uttarakhand Pradesh, 200km north of New Delhi, is an ideal place to begin. In early season, tributaries of the Holy Ganges River flow through polish granite canyons and offer days and days of quality world-class white water at every turn. Just take a look at some of the photos from Gene17 scouting missions in the last couple of years. Day 1 Arrive at Delhi airport and travel onward to Rishikesh staying at a riverside rafting base on the Ganges. Day 2 After meeting our drivers for the trip we’ll head to the top Pindar River. Day 3-5 Shake down on the continuous class III+/IV rapids of the Pindar, leaving the river each evening to stay in the local tea houses in the stunning alpine valleys. Day 13 Travel back to Rishikesh staying at the riverside camps. Day 15 Arrive back in Delhi where you can extend your trip or catch a flight home. 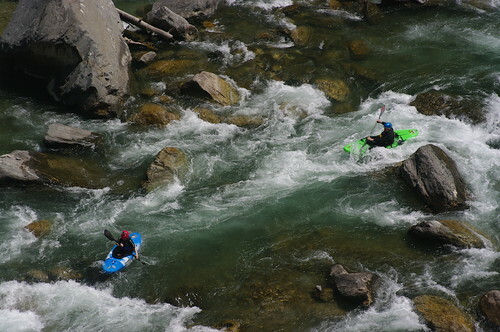 India – Rishikesh Road Trip takes place on Class III+/IV whitewater. The India – Rishikesh Road Trip is suitable for experienced paddlers who are able to paddle for 3 – 4 hours in a day on Class III+ and IV with a sense of adventure. We’ll be paddling this grade for 4-6 hours each day and the water will get progressively more challenging as the trip goes on. You should have experience on continuous white water so things like the Guil in the French Alps, Alpin Sprint in Piemonte, Italy or Otona stretch on the Soča, Slovenia. Generally the rivers are accessible with far road access, but there may be some exposed terrain. This trip begins on an easier section of whitewater, but will soon reflect conditions expected at the grade. Participants should therefore expect to be in a river environment during normal runoff for sometimes extended periods of time. This is adventure paddling in the truest sense of the word! You’ll be staying at hotels, riverside camps in shared accommodation, bed linen provided at hotels, however sleeping bag & sleeping mat is needed for the camping. We’ll provide a continental breakfast, a light lunch and an evening dinner either at a local restaurant or home-cooked by one of our guides.